ORGANIZATION PROFILE - අපගේ සංවිධානය ගැන. Blue, Gold & Silver colors represents Healthy, Long, Life respectively. Curved outline represents the human life from birth to death the middle being the young age. The shade of planet represents the international links. නිල්, රත්‍රන් සහ රීදි පැහැයන් පිළිවෙලින් නිරෝගී, චිර, ජීවනය සඳහාද; අවට රේඛාව උපතේ සිට මරණය දක්වා මිනිස් ජිවිතයද; මධ්‍යය තරුණ වියද; පෘථිවිය ජාත්‍යන්තර සබඳතා ද නියෝජනය කරයි. 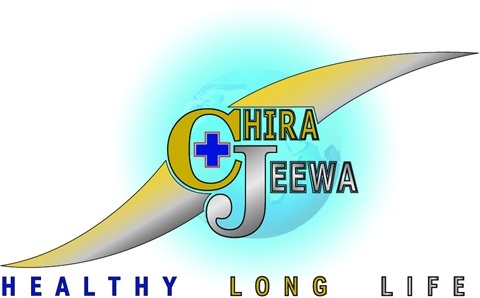 HEALTHY LONG LIFE - නිරෝගී චිර ජීවනය. 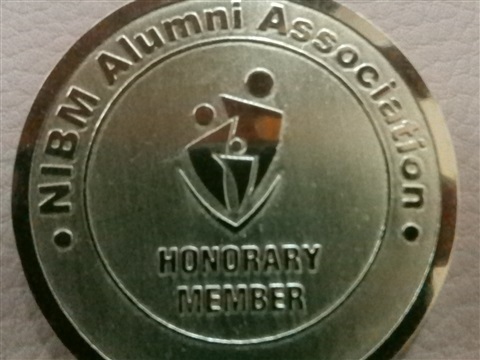 To become an essential life partner for our members in their individual health management and to expand our membership island wide. අපගේ සාමාජිකයින්ගේ පෞද්ගලික සෞඛ්‍ය කළමණාකරනයේදී ජිවිතයට අත්‍යවශ්‍ය සහකරුවකු වීම සහ අපගේ සාමාජිකත්වය දිවයින පුරා ව්‍යාප්ත කීරීම. To give a compassionate service, by mixing medicine, information technology and management philosophy, to enjoy a healthy long life, which ultimately produce equal benefits to each other. සැමට සමාන ප්‍රතිලාභ ලැබෙන හෘධ්‍යාංගම සේවාවක්, වෛද්‍ය විද්‍යාව, තොරතුරු තාක්ෂණය සහ කළමණාකරන දර්ශනය මිශ්‍රණය කිරීම තුලින් ලබාදී සැමට නිරෝගී චිර - ජීවනය භුක්ති විඳීමට ඉඩ සැලසීම. 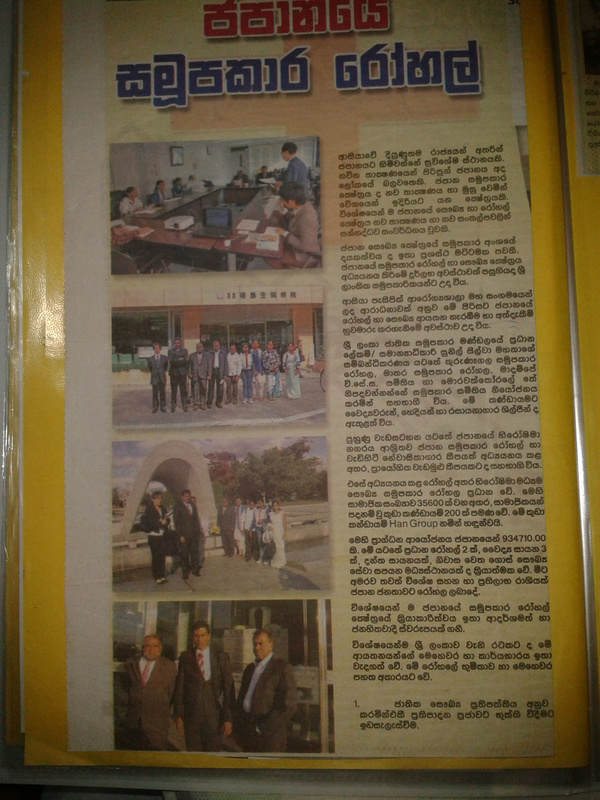 OUR MANAGEMENT - අපගේ කළමණාකරන ව්‍යුහය. To see President's messege click here. 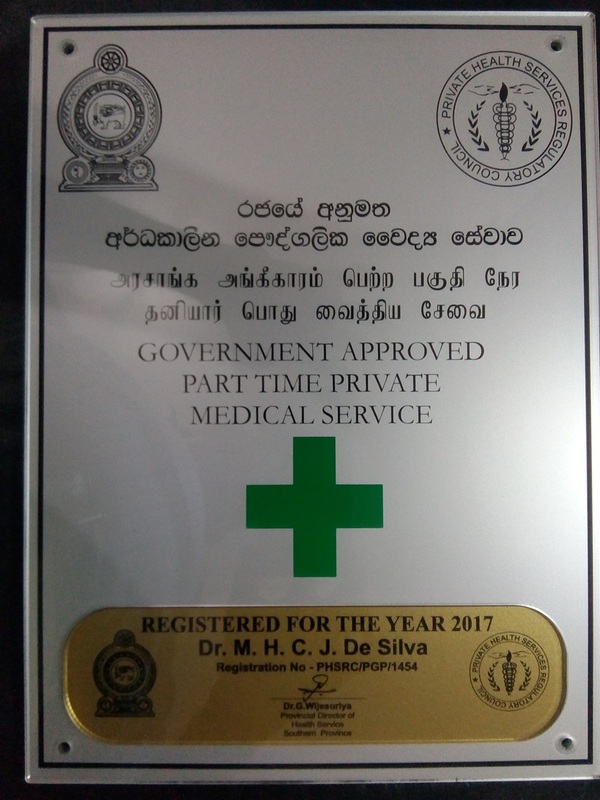 Faculty of Medicine, University of Ruhuna, Karapitiya, Galle. Sri Lanka. Bsc Business Administration (University of Sri Jayawardanapura) Msc in Service Managment ( University of Colombo). 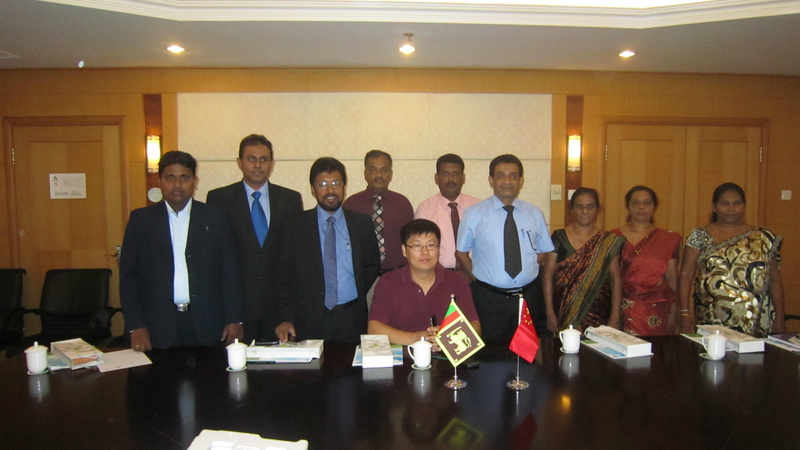 Consultant Cardiac Electropysiologist & Cardiologist- Teaching Hospital, Karapitiya & National Hospital of Sri Lanka. 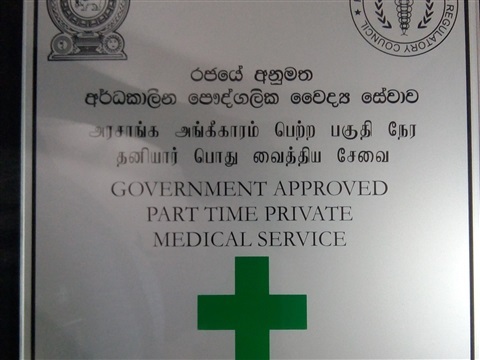 Consultant Obstetrician & Gynaecologist - District General Hospital, Hambanthota. 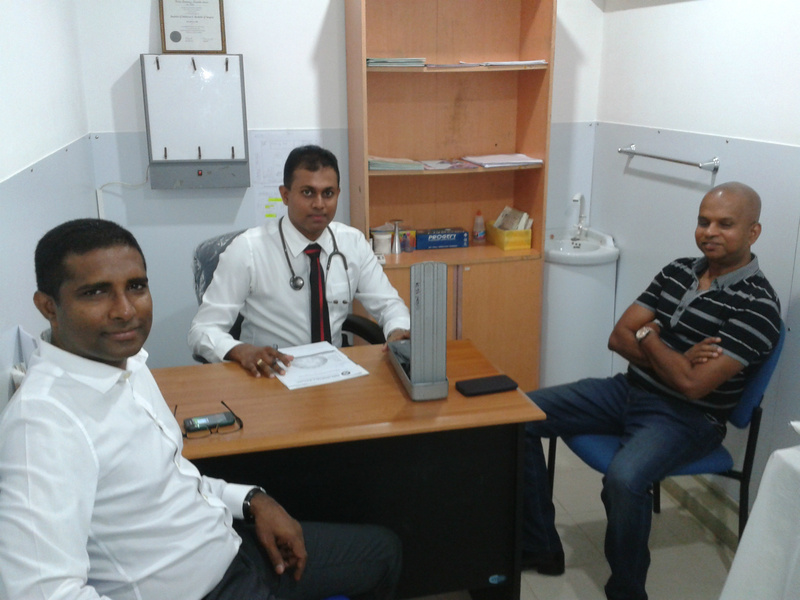 Consultant Ophthalmologist, Specialist Orbital & Oculoplastic Surgeon - Teaching Hospital - Batticaloa. 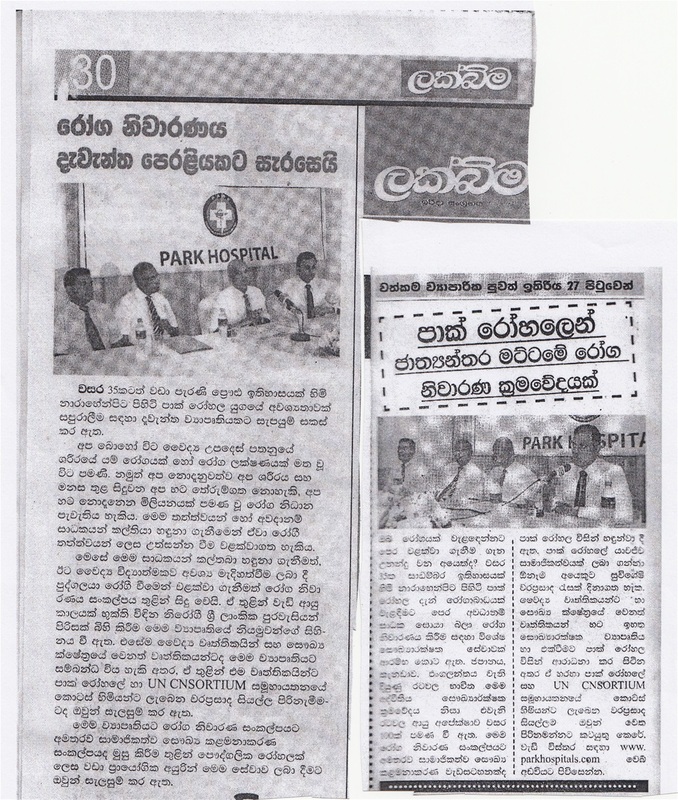 Consultant Cardiologist - Teaching Hospital - Anuradhapura. Senior Consultant General Surgeon - National Hospital of Sri Lanka. 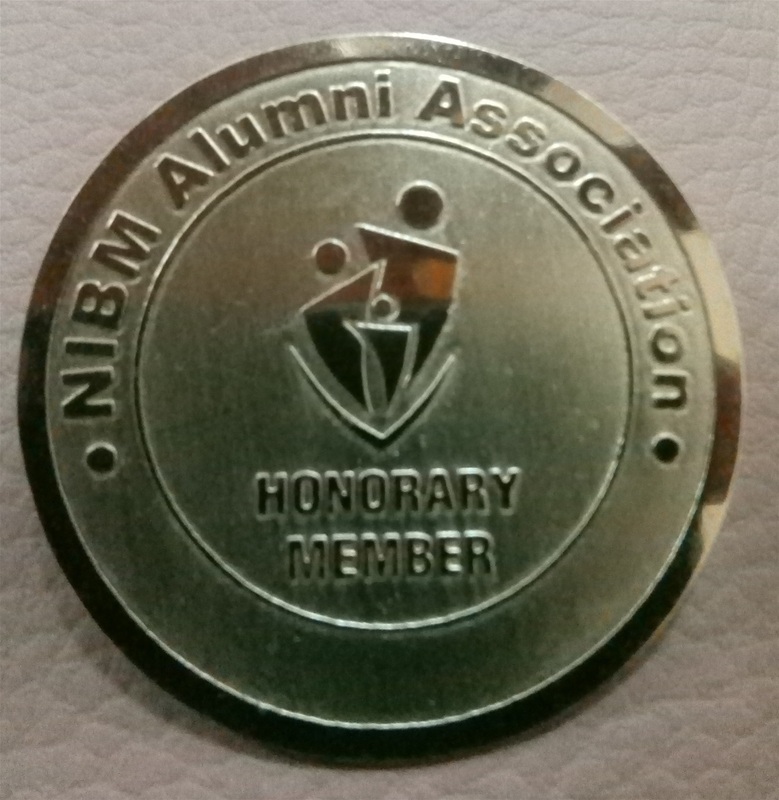 Consultant and senior lecturer - National Institute of Business Management, Colombo-07. 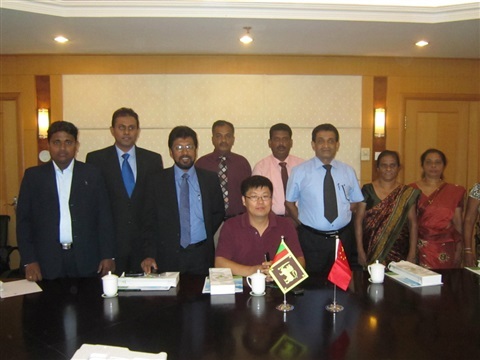 2- Mr. Thushara L. Geeganage (MCSA, ). Consultant for the Ministry of Industries & Commerce-Sri Lanka; Former Chief Executive/General Secretary of National Cooperative Council of Sri Lanka. 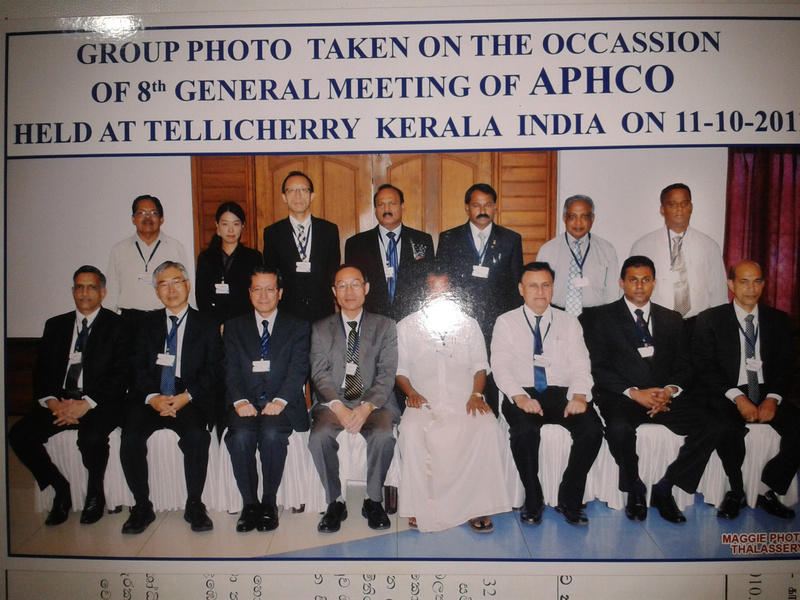 2-Dr.Asanka Thilakarathna. (D.Mgt ,M.A , P.G Dip ,B A (Hons) Dip. in Journalism. Secretary/Assistant General Manager.- National Cooperative Council of Sri Lanka. We are basically being an E- health service provider; large percentage of our organization is virtual in nature rather than is physical. In that environment we have created an interphase (Health profile account) for doctors in one side and our members in the other side. Using this virtual discussion table, all parties can maintain rational, scientific and logical communications regarding health issues. The prime features of health profile account are 100% privacy, user friendliness, comprehensiveness, compassionate service, specialist opinions all the time, equal benefits to all members, health risk minimization, ideal high standard medical record keeping/ documentations. 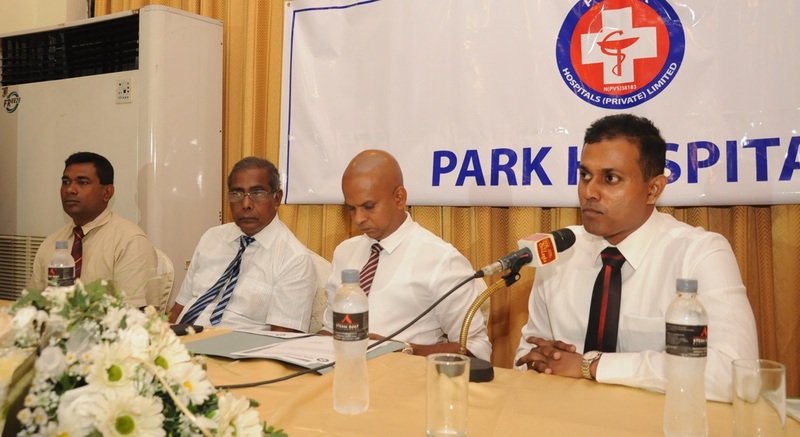 01- To establish more regional centers with same model as established in firstly registered center at Beliaththa. 02- To develop a mobile phone application( Mobile App.) to assist the our web base services. 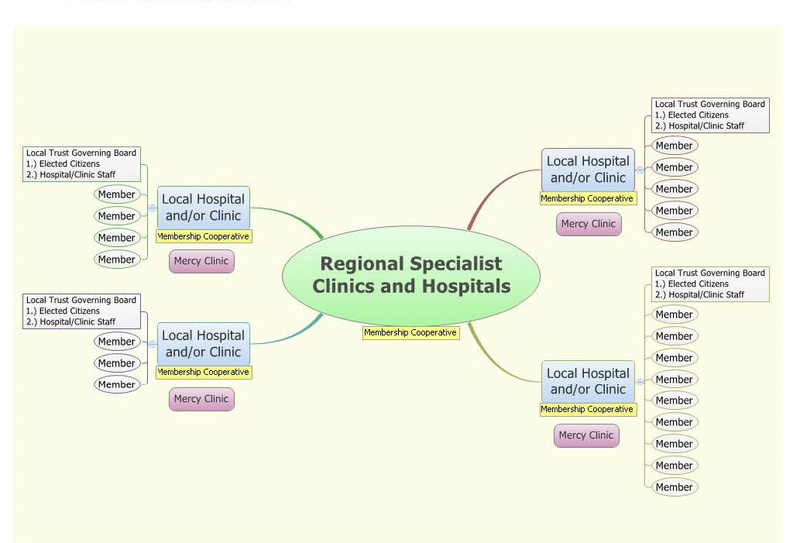 03- To develop a software program for self-health assessment, using common symptoms in medicine. 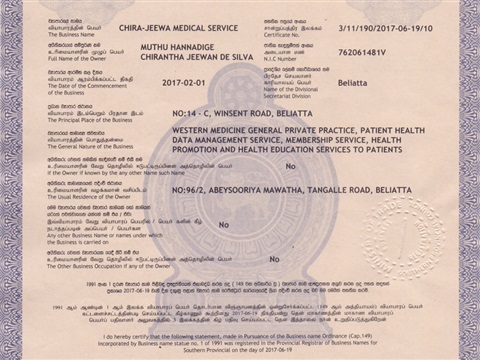 04- To introduce more sophisticated membership health card with in-built micro chip. 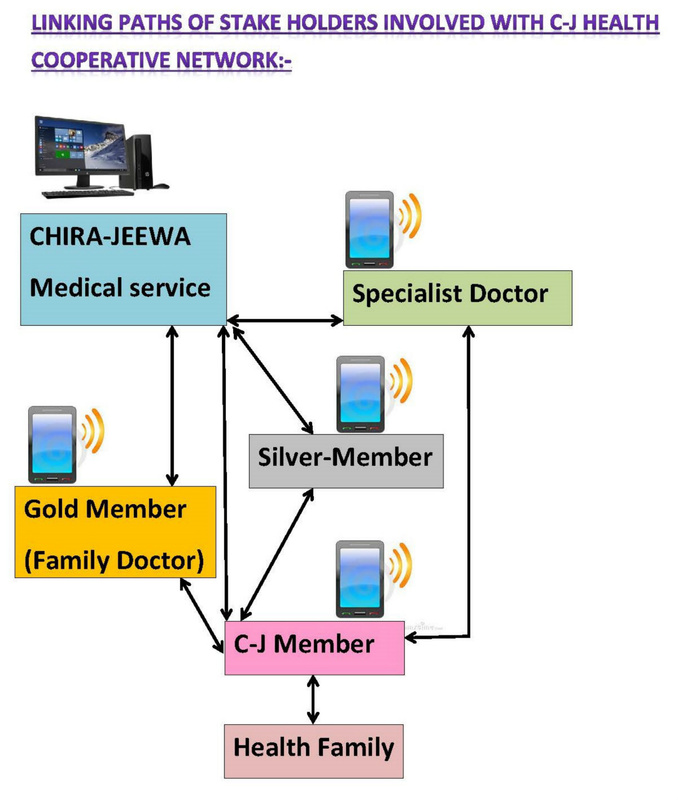 Regional center membership health co-operative network. This diagram represents the outline of our planned regional center network. 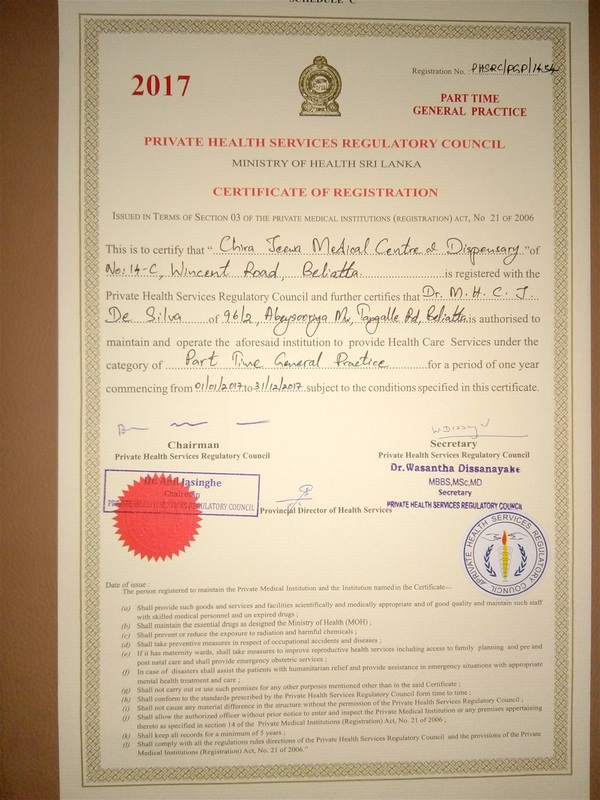 It shows how the Members, Family doctors and Specialist doctors are linked to establish a proper and systematic referral system. 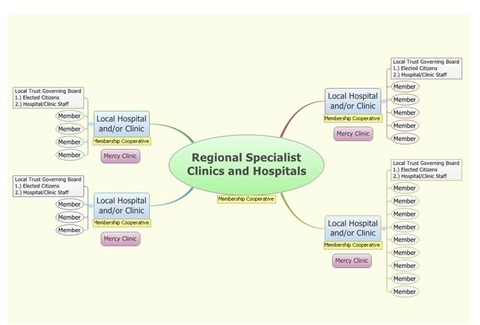 This kind of referral systems are available in developed countries. But in our motherland we do not have such scientific referral system which is a main reason for our system failures. Please note that this is only a typical system. But strategic alterations of this model can be done without disfiguring the basic outline to match it to the local community. 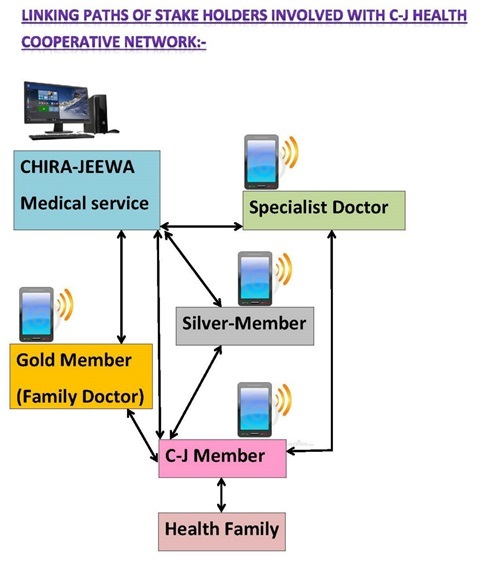 The GOLD-MEMBERS (Family doctors) play a major role in this model implementation. ඉහත රුප සටහනට අනුව අප සැලසුම් කරන ප්‍රාදේශිය සමාජිකත්ව සෞඛ්‍ය සමුපාකාරික ජාලය ක්‍රියාත්මක වෙයි. එහිදී සාමාජිකයා, පවුලේ වෛද්‍යවරයා සහ විශේෂඥ වෛද්‍යවරයා එකිනෙකා සම්බන්ධිකරනය වනුයේ වෛද්‍ය විද්‍යාත්මක ක්‍රමවේදයට අනුව සෞඛ්‍ය ගැටළු වෙනුවෙන් නිශ්චිත යොමු කිරිමේ ක්‍රමයක් ස්ථාපිත වන පරිදිය. මෙවැනි වු යොමුකිරිමේ දියුණු ක්‍රමවේද යුරෝපය වැනි දියුණු රට වල පවතී. නමුත් අප රට තුළ එවැනි ක්‍රමවත් සහ විද්‍යාත්මක පද්ධතියක් නොමැති විම රෝග නිවාරනය සම්බන්ධව අප, දියුණු රට වලට සාපේක්ෂව පහළ මට්ටමක පැවතීමට ප්‍රධානම හේතුවකි. රූපයේ දැක්වෙනුයේ දර්ශීය පද්ධතියක් පමණි. නමුත් උපායමාර්ගික ක්‍රම වේද හරහා එහි මුලික හරයට සහ සිද්ධාන්ත වලට හානි නොවන ලෙස තම ප්‍රජාවට ගැලපෙන ලෙස එය හැඩගස්වා ගැනිමට ප්‍රාදේශිය නායකත්වයට හැකිය. මෙම ප්‍රාදේශිය නායකත්වයේ නියමුවා සහ මෙම මොඩලය ක්‍රියාත්මක කිරීමේදී විශේෂ කාර්යභාරයක් ඉටු කරන චරිතය වනුයේ අපගේ GOLD සාමාජිකයා හෙවත් පවුලේ වෛද්‍යවරයාය. As shown in above diagram five main categories of stake holders have been linked to each other in a single interphase. But all extremities of arrows are protected by usernames and passwords. 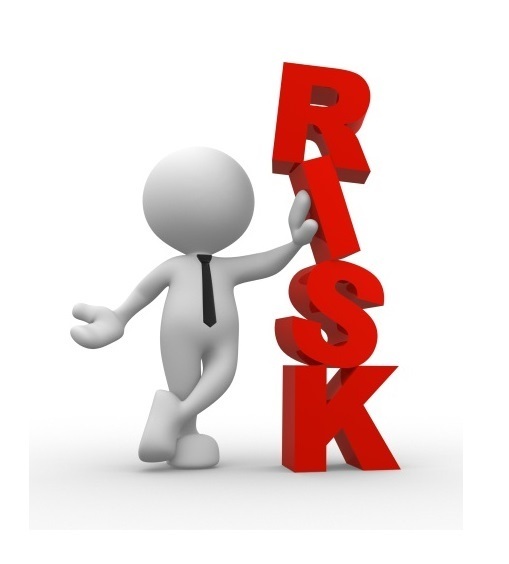 There are many back ends in the system for future linking of other stake holders like pharmacist, labs etc. 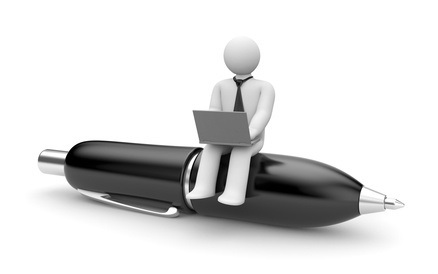 depending on the members requests and service providers demand. You can study the video below to learn more about the importance of these linking paths. ඉහත රුපයට අනුව ප්‍රධාන පුද්ගල කාණ්ඩ 5ක් තනි අන්තර්තලයකට සම්බන්ධ කරනු ලැබ ඇත. නමුත් එම සබඳතාවයේ ඊතල වල කෙළවරවල් දෙකම රහස් පද වලින් ආරක්ෂා කළ තොරතුරු පද්ධතියක් හරහා ක්‍රියාත්මක වෙයි. මීට අමතරව එම පද්ධතියට ඉදිරියේදී තවත් පාර්ෂව සම්බන්ධීකරනය කිරීමට හැකි වන ලෙස සකසා ඇත. උදාහරණ ලෙස ඔසුසැල්, රසායනාගාර ආදීය. මෙය සාමාජිකයාගේ කැමැත්ත සහ සේවාව සැපයීමට ඉදිරිපත් වන්නන්ගේ ඉල්ලුම මත අවස්ථානුකුලව සිදු කරනු ලැබේ. මෙම සම්බන්ධීකරන පද්ධතියේ වටිනාකම සහ වැදගත්කම පහත දැක්වෙන ස්‍රව්‍ය දෘෂ්‍ය (VIDEO) ඉදිරිපත් කිරීම හරහා ඔබට තවදුරටත් අවබෝධ කර ගැනීමට හැකි වනු ඇත. Video: How e-health make your life easy & fast - විද්‍යුත් මාධ්‍ය සෞඛ්‍ය සේවාවන් ඔබගේ ජිවිතය වඩා පහසු සහ වේගවත් කරන ආකාරය. This will be the ultimate result of getting CHIRA-JEEWA membership - චිර -ජිව සාමාජිකත්වය ලබාගැනීමේ අවසන් පුතිඵලය මෙයයි. 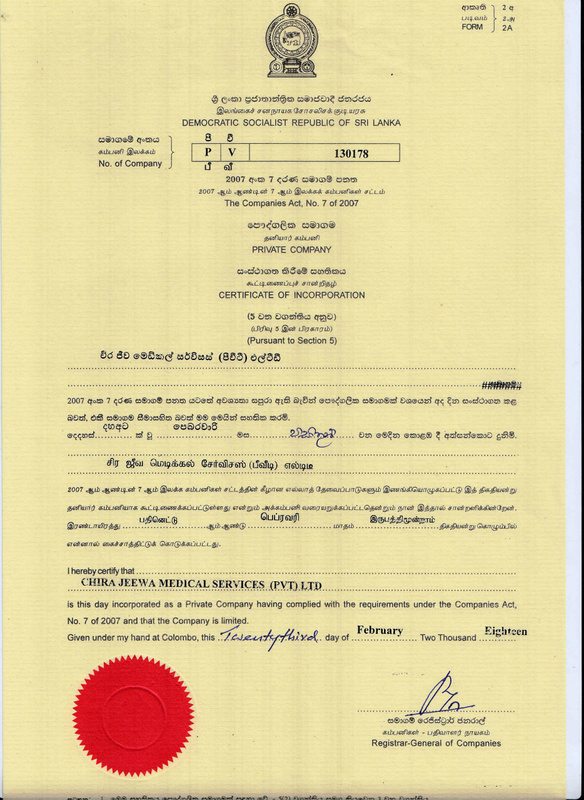 Then in year 2014 the same project with lot of modifications was implemented in Park hospitals private limited at Narahempita, Colombo-05. It was also under the leadership of our current president. It was a highly successful project at that time. After implementing this concept in Park Hospital, few other private hospitals in Colombo city, started projects like this. 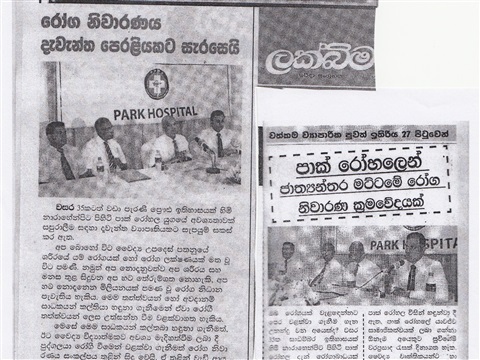 Project reached its optimum level through park hospital management. 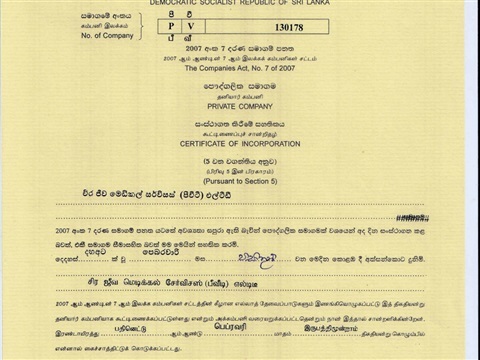 අපගේ ගමනේ ඇරඹුම 2010 වර්ෂයයි. ඒ ඉතා කුඩා නියමු ව්‍යාපෘතියක් ලෙස මාතර සමුපාකාර රෝහල තුල ක්‍රියාත්මක වුනු ප්‍රවර්ධන ව්‍යාපෘතියකිනි. එය එවකට එම රෝහලේ සභාපති ධුරය දැරු, මෙම වර්ථමාන චිර -ජීව සංවිධානයේ නිර්මාතෘ සහ විධායක විසින් නායකත්වය ලබා දුන් සහ හඳුන්වාදුන් කුඩා ව්‍යාපෘතියකි. එම ව්‍යාපෘතිය එවකට ශ්‍රී ලංකාව තුල සහ අන්තර්ජාතිකව සමුපාකාර රෝහල් ක්ෂේත්‍ර තුළ විශාල ඇගයීමකට ලක් විය. විශේෂයෙන්ම ආසියා පැසිෆික් සෞඛ්‍ය සමුපාකාරික සංවිධානය (APHCO) සහ ජපානයේ සෞඛ්‍ය සහ ශුභසාධන සමුපාකාරික ෆෙඩරේෂනය තුල එය විශේෂ ඇගයීමට බඳුන් විය. 2014 වසරේදී තවදුරටත් සංවර්ධනය කර කොළඹ - 5 , පාක් රෝහල හරහා මධ්‍යස්ථ පරිමාණයේ ව්‍යාපෘතියක් ලෙස එය ක්‍රීයාවට නැංවුනි. එයටද නායකත්වය ලැබුනේ අප සංවිධානයේ නිර්මාතෘ හරහාය. එය එවකට ඉතා සාර්ථක ව්‍යාපෘතියක් වුයේ එම පාක් රෝහලේ කළමණාකාරිත්වයෙන් ලද සහයෝගය නිසාය. මෙම සංකල්පය විවිධ මට්ටමින් කොළඹ අවට පෞද්ගලික රෝහල් කිහිපයකම ඊට පසුව ක්‍රීයාත්මක විය. වර්ෂ 2017 පෙබරවාරි මාසයේ දකුණු පළාත තුළ ව්‍යාපාර නාමාවලියෙහි ලියාපදිංචි වී වෙනමම ව්‍යාපාරයක් ලෙස මුල් ගල් තැබීම එහි හැරවුම් ලක්ෂයයි. ඉතා දුෂ්කර වු සංවර්ධන සහ සැලසුම් කිරිම් පියවර සහිත කාලයකට පසුව සංවිධානය වර්ථමාන තත්ත්වයට පත්ව ඇත්තේ විශාල කැපකිරීම් රාශියක ප්‍රතිඵල ලෙසයි. ක්ෂේත්‍ර කිහිපයක මුලධර්මයන් ප්‍රායෝගික භාවිතයට ගනිමින් සහ එම පරිචයන්හි සැබෑ වටිනාකම් වලට මුල්තැන දෙමින් බිහිව ඇති සුවිශේෂී සංවිධානයක් ලෙස චිර - ජීව සංවිධානය දිගු ගමනක් යාමට අද වන විට ගමන් අරඹා ඇත. අප නිර්මාතෘ, මේ සියළු සැලසුම් සහ ඒවායේහි ඉන් ඔබ්බට ගිය ප්‍රායෝගික ක්‍රියාකාරකම් පිටුපස සිටින වැදගත් ශක්තියකි. 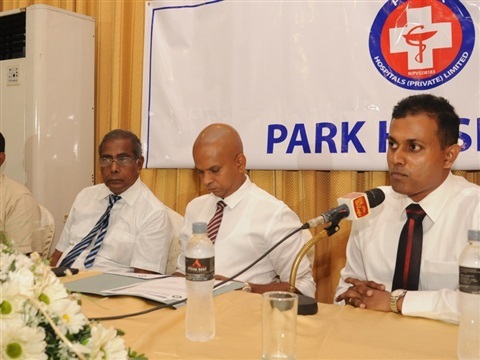 First members registered at Park Hospital; The Chairman of Prime Land group, Mr. Brahmanage Premalal and Dr. Sanjayadev Munasinghe, the CEO- UN consortium. 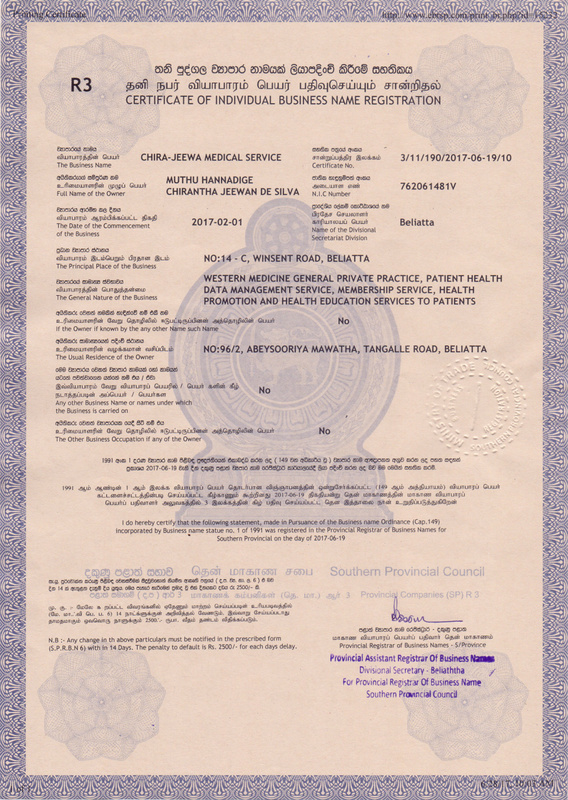 We are operating under state law and order and within the framework of medical ethics. 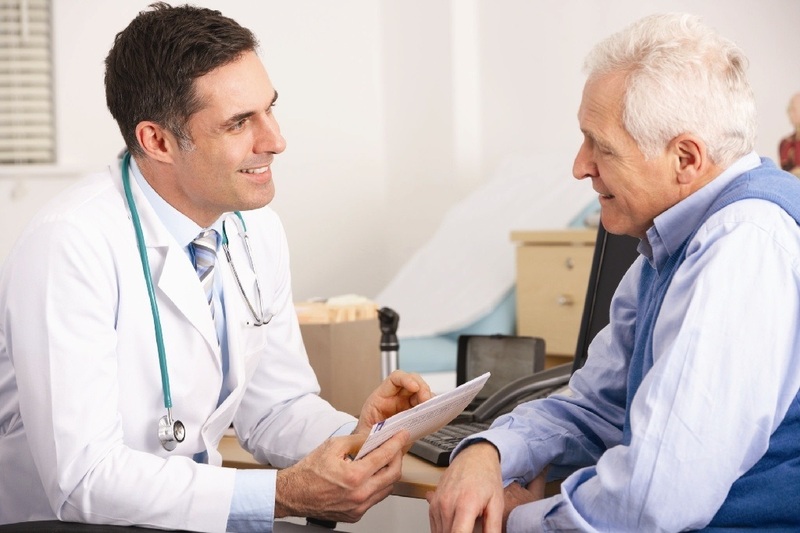 This business is consistent with the self-management support for chronic disease using technology tools suggested in both the Affordable Care Act (ACA) and the Health Information Technology for Economic and Clinical Health Act (HITECH Act) in USA. 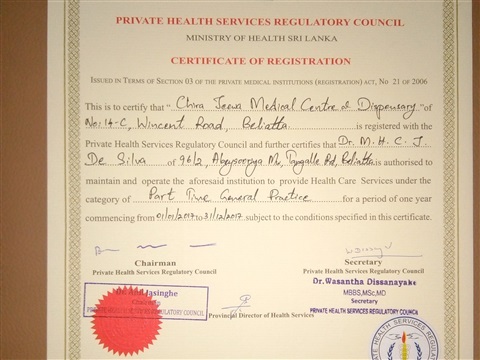 Also it is consistent with the existing Sri Lankan Government acts and health ministry empowerment. Further it is operating according to the guidelines published by World Health Organization (WHO). WHO assembly in 2013 recognized the need for health data standardization to be part of e-health systems and services, and the importance of proper governance and operation of health-related internet domains. 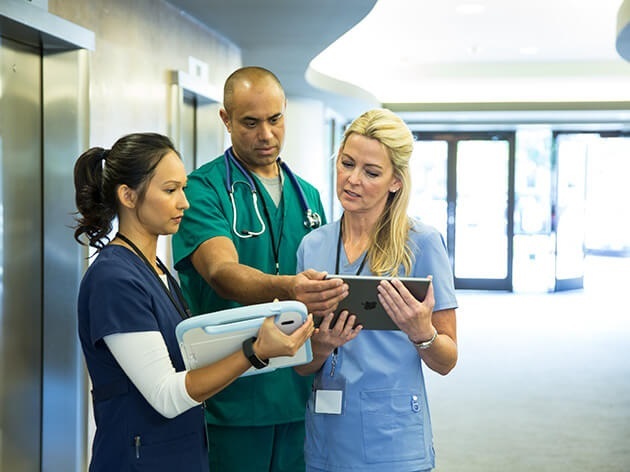 Leaders and policy makers on a global scale are strongly encouraging the use of this e-health technology enhanced Chronic Care Model, including all developed countries. The Washington think tank “e-health Initiative” (promoting policy focused on research and education in e-health), the Institute of Medicine (IOM)- USA, and the Agency for Healthcare Research and Quality (AHRQ) - USA, also recommend to use the basics of this e-CCM as a tool to support self-management in chronic illness. අප රජයේ නීති-රීති වලට අනුව සහ වෛද්‍ය විද්‍යාවේ සාරධර්ම වලට අනුව ක්‍රියාත්මක වන සංවිධානයකි. 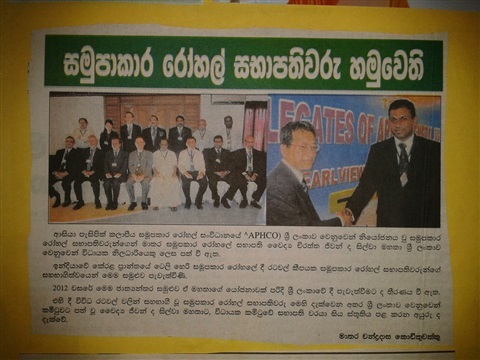 මෙම සංකල්පය ඇමෙරිකා එක්සත් ජනපද රජයෙහි ACA සහ HITECH වැනි ඇමෙරිකානු රාජ්‍ය නිවේදන (ප්‍රතිපත්ති) වලට ගැලපෙන පරිදි මුලින්ම බිහිවිඇත. 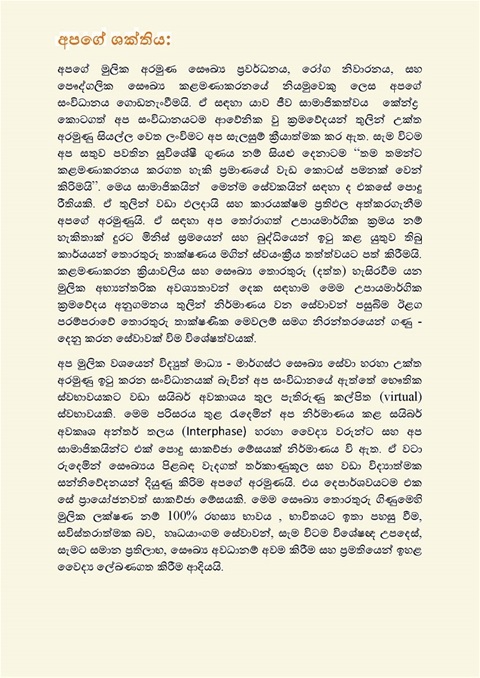 එසේම එය වර්ථමාන ශ්‍රී ලංකා රජයේ සහ සෞඛ්‍ය අමාත්‍යංශ බලගැන්වීම වලට අනුකූලව ක්‍රීයාත්මක වෙයි. විශේෂයෙන්ම පෞද්ගලික වෛද්‍ය සේවා නියමන කොමිෂන් සභාව(PHSRC) මෙම ක්‍රියාන්විතයේ සියළු පියවර අනුමත කර ඇත. එසේම ලෝක සෞඛ්‍ය සංවිධානය විසින් සිය 2013 සැසි වාරයේදී සම්මත කර ප්‍රකාශ කළ මාර්ගෝපදේශ වලට අනුව අපි ක්‍රියාත්මක වන්නෙමු. මෙම WHO 2013 සම්මුතියෙහි, සෞඛ්‍ය තොරතුරු ප්‍රමිතිකරනයට අදාලව විද්‍යුත් මාධ්‍ය ඉලෙක්ට්‍රොනික් පද්ධති සහ සේවාවන්ද, එවැනි සේවාවන් සපයන අන්තර්ජාල URL ඩොමේන් වලද, නිසි පාලනය සහ වැදගත් කම ඉස්මතු කර ඇත. එම සේවා සැපයිය යුතු අන්තර්ජාතිකව පිළිගත් විද්‍යාත්මක ක්‍රමවේද පිළිබඳව මග පෙන්විම් සපයා ඇත. ලෝක මට්ටමෙන් සෞඛ්‍ය විද්‍යාත්මක රීති සහ ක්‍රම සම්පාදනයේ නියමුවන් ලෙස ඇමරිකාව, යුරෝපය, ඕස්ට්‍රේලියාව ඇතුලු දියුණු රටවල් සියල්ලක්ම පාහේ මෙම විද්‍යුත් මාධ්‍ය මාර්ගස්ථ තාක්ෂණයේ උපකාරය ඇතිව සිදු කරන දිගුකාලීන සෞඛ්‍යාරක්ෂණ මොඩල ක්‍රියාත්මක කිරීම දැඩි ලෙස අනුමත කරයි. ඊට දිරි ගැන්වීම් සපයයි. වොශින්ටන් හි IOM සහ AHRQ වැනි අයතන මගින් මෙම චිර - ජිව සංවිධානයේ මවු ආකෘතිය වන E –CCM සෞඛ්‍යාරක්ෂණ මොඩලය ක්‍රියාත්මක කිරීම ඇමෙරිකානු රජයට අනුමත කර ඇත. එම සෞඛ්‍යාරක්ෂණ මොඩලයේ ශ්‍රී ලංකික ව්‍යුත්පන්නයක් ලෙස මෙම චිර - ජිව සංවිධානය බිහිවී ක්‍රීයාත්මක වෙයි. The economic and financial base of the CJMS is a mixture of francized business management concepts and co-operative management concepts. 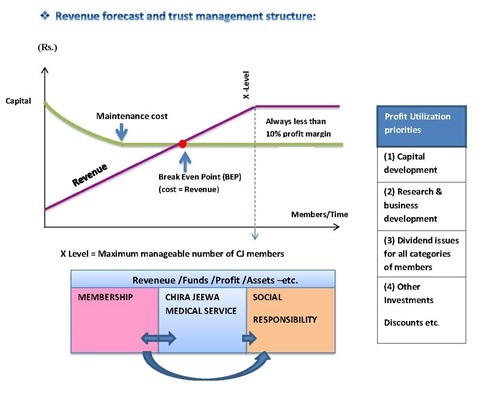 As outlined in above diagram it has a limited profit target and at the same time it has the concept of distributing that profit for the benefit of all stakeholders. Therefore CJMS is going neither towards pure capitalism nor towards pure socialism. The cost reduction strategy in every step of management is the secret of planned profit, rather than going towards the higher market prices of their services. 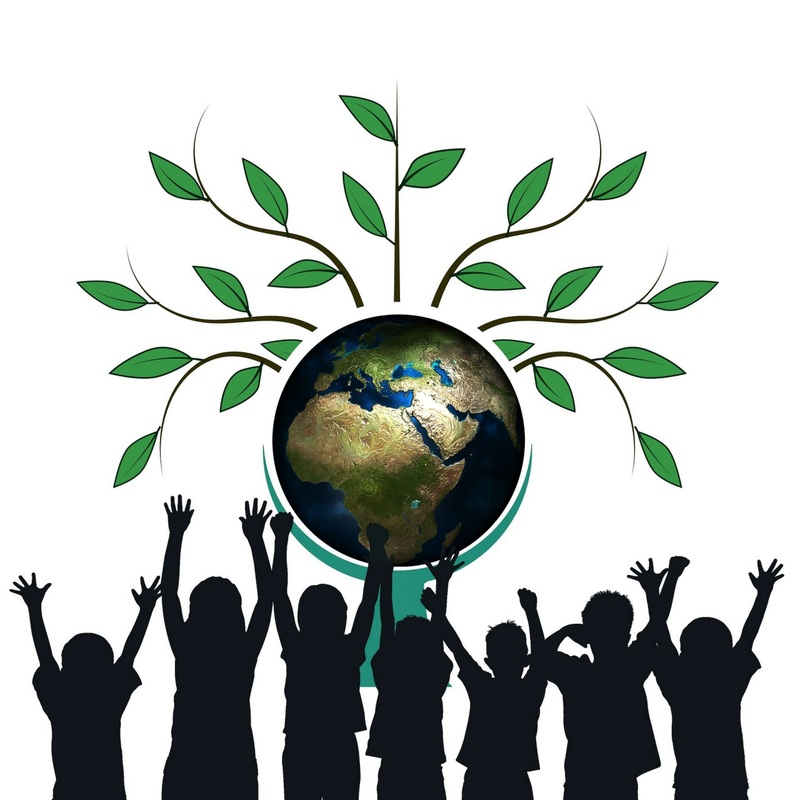 In that case the social responsibility plays a major role throughout its business operations. Since the software and web site domains have limited capacities, the capital investment to purchase domains in internet (web) have limited capacities of earning profits by selling web spaces to customers (members). Therefore to increase the profit margins and profit amount there should be additional purchasing of web domains which is a capital investment again. In other words there is maximum manageable number of customers for each unit of web domains purchasing which should give profits as well. 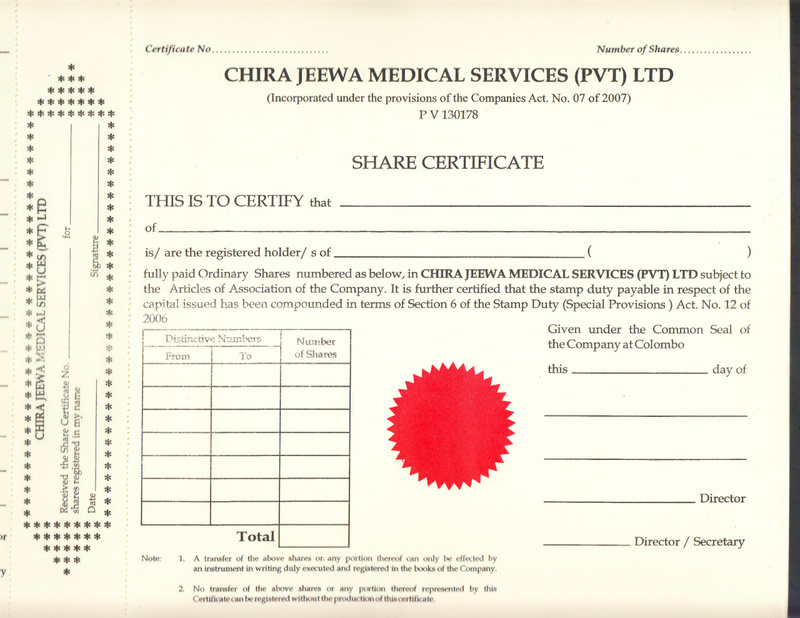 To overcome this challenge the CJMS have chosen the strategy of automatization of management process, data handling process and decision making process both to minimize cost and to maximize the service / customer capacity in view of achieving a profit margin which can sustain the mission within the framework of its rather partly socialistic nature. 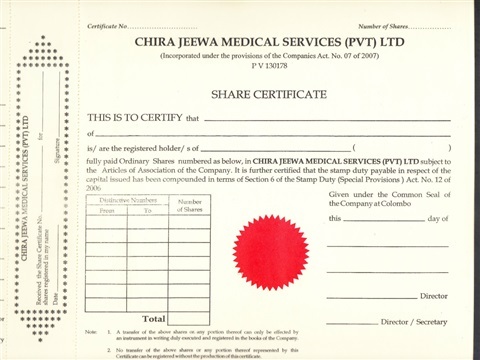 Rather than giving discounts and commissions for the stakeholders CJMS is unique in giving dividends to them. This bond / business partnership creates a kind of ownership with company to all categories of stakeholders / members which is a driving force for co-operation among each other. චිර - ජීව සංවිධානයේ ආර්ථික සහ මුල්‍ය කළමණාකරන ව්‍යුහය වෙළඳපොළ ආර්ථිකය තුල සමතුලිත වන ව්‍යාපාර කළමනාකරනය සහ සමුපාකාර මුල්‍ය කළමණාකරනය යන මුලධර්ම දෙකෙහිම මිශ්‍රණයකි. ඉහත රුප සටහනේ පැහැදිලි කර ඇති පරිදි අපගේ ලාභ සීමාවන් ඉතාමත් සිමා සහිතය. එම ලාභ ඉපයීම් පවා නැවතත් වැඩි ප්‍රමාණයක් සාමාජිකයන් වෙතම ලභාංශ ලෙස බෙදාදීම සහ සමාජ සත්කාර / වගකීම් වෙනුවෙන් ආයෝජනය කිරීමද මුලික ලක්ෂණයකි. මේ සියල්ල තුලින් සංවිධානයේ මුදුන් අරමුණු සිය සාමාජිකත්වය සහ ඔවුන් ජීවත් වන සමාජ - ආර්ථික සංස්කෘතික වට පිටාව මිස පෞද්ගලික ලාභාපේක්ෂාවෙන් නොවන බව පැහැදිළිය. මේ අනුව බැලු කළ චිර - ජීව සංවිධානය පුර්ණ ධන වාදය හෝ පුර්ණ සමාජවාදය නොවන අතරමැදි දර්ශණයක් මත පදනම් වු ආර්ථික න්‍යායක් අනුගමනය කරන සුවිශේෂි සංවිධානයකි. කළමණාකරනයේ සෑම පියවරකදීම මුල්‍ය පිරිවැය අවම කිරීමේ උපාය මාර්ගික ක්‍රම වේදය තුලින් ලාභා ඉපයීම මිස සේවාවන්හි ඉහළ වෙළඳපොළ මිල ගණන් භාවිතා කරමින් ලාභා ඉපයීමක් අප සංවිධානය තුළ කිසිවිටක සිදු නොවෙයි. 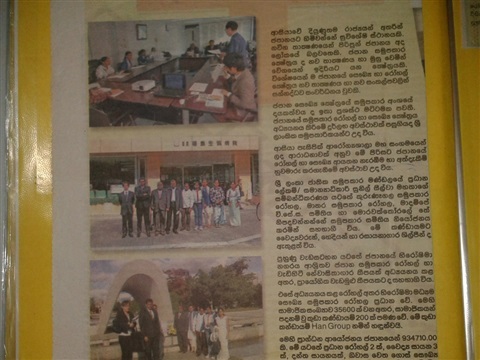 අපගේ මුලික ප්‍රතිපත්තිය එයයි. මෙම රාමුව තුළ ‘‘සමාජ - වගකීම” යන අංශයට ප්‍රධාන කාර්යභාරයක් හිමි වෙයි. අපගේ මුළු ව්‍යාපාර ක්‍රීයාන්විතය පුරාම විහිදුන කොඳු නාරටිය එයයි. අන්තර්ජාලය තුල අප මිලදි ගනු ලබන URL ඩොමේන් සතුවූ ධාරිතාවන් සිමා සහිත නිසා ඒවා මිළදී ගැනිමට අප යොදවන මුල ධනය වෙනුවෙන් , ඒවා සාමාජිකයින්ට අලෙවි කිරීම හරහා අපට ලැබෙන ලාභායද සීමා සහිතය. එනම් මිළදී ගනු ලබන එක් URL ඩොමේන් ඒකකයකට අනුයුක්ත කළ හැති සාමාජිකයන් ගනන නියතයක් නිසා සාමාජිකයන් ගනන වැඩි වන සැම විටම අපහට නව URL ඩොමේන් ධාරිතාවන් මිළදී ගැනීමට සිදුවේ. මේ සඳහා මුල ධනයක් යෙදවිමට අපහට සිදුවේ. මෙම අභියෝගය ජය ගැනිමට චිර - ජිව ආයතනය භාවිතා කරන ක්‍රමෝපායන් වන්නේ, දත්ත හැසිරවීමේ සහ කළමණාකරන ක්‍රීයාවලිය හැකිතාක් ස්වයංක්‍රීය කිරීම තුළින් පිරිවැය අවම කරගැනීමයි. එසේම උක්ත ප්‍රතිපත්ති සහ මුලධර්මයන්ට අනුව ව්‍යාපාර කටයුතු පවත්වා ගැනීමට ප්‍රමාණවත් ලාභා ඉපයීමක්ද සිදුවෙයි. පාරිභෝගිකයන්ට ප්‍රවර්ධන සහ දිමනා ලබාදීම වෙනුවට සාමාජිකයින්ට ලාභාංශ බෙදාදීම තුලින් අප සුවිශේෂි ආයතනයක් ලෙස ක්‍රීයාත්මක වෙයි. ඒ තුළින් සාමාජිකයා හට අප ආයතනය / සංවිධානය පිළිබඳ ඇති වන බැඳීම (සබඳතාව) එහි මුලධනය හිමි කරුවෙකුට හිමිවන සබඳතාවයට සමානයි. සැමට - සමාන ප්‍රතිලාභ හිමිවන ලෙස අන්යෝන්ය සබඳතාවන් ගොඩනැංවීමට මේ තුලින් අපට හැකි වී ඇත. Video: Learn more about co-operative concepts - සමුපාකාරීක සංකල්පය පිළිබඳව තවදුරටත් ඉගෙනගනිමු.